Well, happy post-Thanksgiving food coma/shopping frenzy. Things here were quiet but fun. 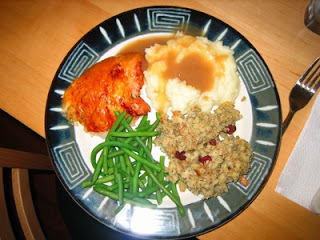 Andy made a fabulous Thanksgiving feast which the three of us thoroughly enjoyed. Well, two of us did. The third was too tired and wound up to at so ended up going to bed after two bites of turkey and three bites of roll. We spent Thursday morning exploring part of the wildlife refuge up in Alviso. This is the area at the very southern tip of the bay, and we got to see lots of marshy stuff and shorebirds doing shorebird type things. It was neato! Next time, we’ll bring bicycles or at the very least the gigantic stroller so that we can explore a little more. Friday was dominated by an ill-fated attempt to procure a loveseat for the den. We fell for a fabulous ad that (surprise of surprises) turned out to be a really crummy deal in disguise. Ah well. Today, we spent the morning at Vasona Park in Los Gatos. Technically, I think we were at the park next door to Vasona Park. It has an awesome playground featuring big shade trees and benches all around, Oh, and the slides and climbing things are cool too. This is the same park we visited waaaay back when we first arrived-the one with the miniature railroad! In the winter months they run a diesel engine instead of a steam engine, so that was a new and exciting experience. Elise loved it, and at $2/head for a 20 minute ride it’s a fabulous deal. Happily, we have no idea what we’ll be doing tomorrow. Enjoying the last day of our four day weekend is our big goal. Woo hooo! Having all of this time together is really helping San Jose feel like home now. Something to be thankful for indeed!